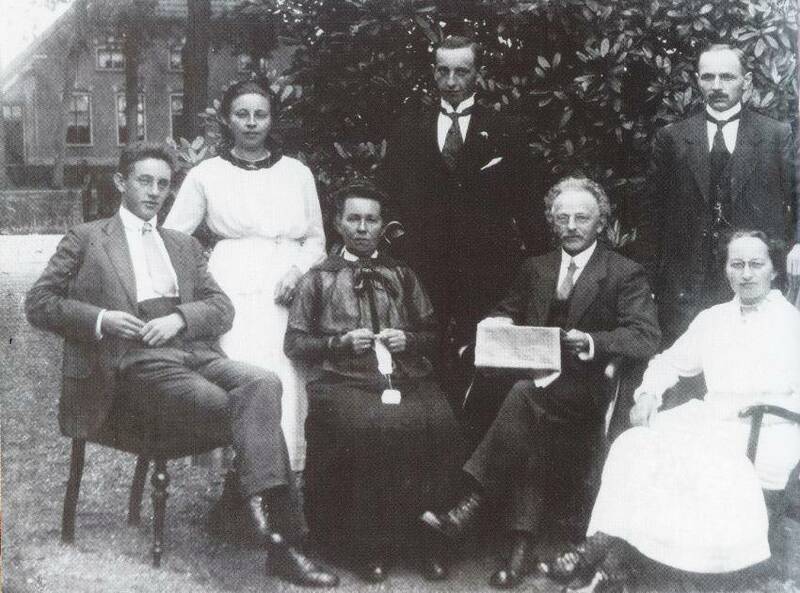 Caption: Hendrikje van Andel-Schipper (2nd from the left) in her youth. She was born June 29, 1890, premature and so tiny that no one thought she would survive. However, she lived to be 115. Because very few humans have survived as long Hennie, it’s only logical to ask whether some of the secrets to her impressive lifespan might lie in her genes. And we find ourselves in a great position to explore such questions, thanks to the convergence of two things: recent advances in DNA sequencing technology, and Hennie’s generous decision, made when she was a mere 82 years old, to donate her body to science upon her death. An international team of scientists, partly funded by NIH, recently set about using DNA sequencing technology to examine Hennie’s genome: both to know what DNA she was born with, but also to look for somatic mutations—the type of DNA mutations that we don’t inherit and that are acquired over the course of our lives. Somatic mutations can occur if a mistake is made when DNA copies itself during cell division or may be caused by environmental factors, such as tobacco or ultraviolet radiation from the sun. Most somatic mutations are harmless, but some can lead to cancer and other diseases. Led by Henne Holstege of Vrije University (VU) Medical Center in Amsterdam, researchers sequenced the genome of Hennie’s blood, which contains the cells that have undergone the most cell divisions over the course of a lifetime, and, consequently, are most prone to mutation. As a control, they also sequenced Hennie’s brain tissue, which has the body’s slowest dividing population of cells and, thus, could serve as a proxy for her genome at birth. You might imagine that someone who reaches the extreme age of 115 may have a low number of somatic mutations because his or her cells have exceptional protection against DNA damage. Holstege and her colleagues rather expected this to be the case for Hennie, particularly because she’d never had leukemia, lymphoma, or any other type of blood cancer. To the researchers’ surprise, the DNA sequencing results showed that Hennie’s blood cells had accumulated about 450 mutations since she was born . That is consistent with a mutation rate of about four mutations per year of life, which is in line with previous work suggesting that laboratory-grown cells derived from younger, healthy people acquire about five mutations annually . Recognizing that circulating blood cells are derived from a large pool of stem cells in the bone marrow, and that each stem cell may have acquired a different set of mutations during life, researchers thought it would be challenging to detect any mutations in a collection of millions of blood cells. After all, in healthy adults, bone marrow contains about 11,000 hematopoietic stem cells, of which about 1,300 are actively dividing and replenishing our blood cells. If just one of those stem cells had undergone a mutation of an A to a T, the sensitivity of current DNA sequencing technology would be very unlikely to discover it. However, further study of Hennie’s blood genome revealed that most of her circulating white blood cells were derived from just two hematopoietic stem cells. Not only did that make the process of detecting Hennie’s somatic mutations much easier, it raised fascinating questions about how the aging process affects bone marrow. While the work still must be reproduced in other older people, the researchers speculate that as we age, the pool of hematopoietic stem cells may shrink, until all of our white blood cells are clones of just a few parent cells. Interestingly, the researchers’ work showed that all 450 mutations in Hennie’s blood genome appear to be neutral. None were linked to blood cancer or any other form of cancer (she was diagnosed and successfully treated for breast cancer at age 100, and died of stomach cancer at age 115). Most occurred in areas of the genome that do not contain or control genes, or in regions that are not conserved among several species (conservation usually signals a vital biological role). Even the few that occurred in known disease genes were predicted to have no impact on protein function. Whether this is the result of chance, or something we don’t yet understand, remains to be determined. Holstege’s team also examined the length of telomeres—the protective sequences at the ends of our chromosomes—in a variety of Hennie’s tissues. Shortening of the telomeres has been associated with aging, cancer, and a higher risk of death. Researchers discovered that the telomeres in Hennie’s blood cells were 17-fold shorter than those in her brain cells, which fits with the fact that these cells had undergone many more cell divisions than those in the brain. Genomics isn’t the only area of biomedical research where Hennie has left her mark. She’s also helped to advance neuroscience. In 2001, at age 111, she began to worry that researchers would no longer accept the donation of her body because she was so old. A researcher was sent out to meet with her—a researcher who just happened to be Holstege’s father, Gert Holstege, then a neuroscientist at University Medical Centre Groningen. Not only did he assure Hennie that biomedical research still wanted her donation, he also learned that she had a keen interest in politics, loved to talk sports, and took particular pride in dressing well. Astonished by Hennie’s exceptional alertness, the neuroscientist decided to document her abilities by putting her through a series of cognitive tests. The results? Hennie was sharper than most people 60–75 years old. A post-mortem exam, conducted immediately after Hennie’s death in 2005, revealed that her brain was free of beta-amyloid plaques, which are characteristic of an aging brain and plentiful in Alzheimer’s disease. In addition, the arteries that supplied her brain with blood were supple, not hardened as is often seen in older brains. Intriguingly, when Hennie’s mother died at the age of 100, she also had no signs of age-related dementia. Based on these findings, Gert Holstege came to the conclusion that neurodegeneration is not an inevitable part of aging . Inspired by Hennie’s legacy, Henne Holstege recently launched the 100-plus Study. The goal is to identify genomic elements that may prevent or reduce the risk of Alzheimer’s disease. Based in Amsterdam, the study will enroll more than 500 cognitively healthy centenarians and their close relatives. Volunteers will have their genomes sequenced and their brain tissue analyzed, and those findings will then be compared to Hennie’s. Already, 50 generous folks who have had the good fortune to live 100 years or more have signed up for the study. Here in the United States, we’re lucky to have an expanding population of centenarians. According to the 2010 U.S. Census, there are approximately 53,400 centenarians living today—and that number is projected to grow to 601,000 by 2050 . That provides an exciting opportunity to pursue our own studies of this remarkable group of people. To search for secrets of longevity, NIH’s National Institute on Aging (NIA) is supporting a number of studies. The Long Life Family Study, which involves more than 5,000 participants from 850 families with members age 79 and older, and the Kuakini Hawaii Lifespan Study, which follows about 8,000 Japanese-American men, are currently closed to enrollment. However, the Longevity Genes Project, which involves Ashkenazi Jews who have at least one parent who survived to age 95 or older, and the New England Centenarian Study, which focuses on people age 105 and older and their family members, are still looking for participants. Somatic mutations found in the healthy blood compartment of a 115-year-old woman demonstrate oligoclonal hematopoiesis. Holstege H et al. Genome Res. 2014 Apr 23. Epub ahead of print. The origin and evolution of mutations in acute myeloid leukemia. Welch JS et al. Cell. 2012 Jul 20;150(2):264-78. No disease in the brain of a 115-year-old woman. den Dunnen WF, Brouwer WH, Bijlard E, Kamphuis J, van Linschoten K, Eggens-Meijer E, Holstege G. Neurobiol Aging. 2008 Aug;29(8):1127-32.